Labels, Colour & Style Options for this Product: As per image - purple tintBlueCream/IvoryGoldGreenGreen & Red TintPinkPink & Purple Tinted WrapRedSilver 1000 currently available in stock to buy now. Mini champagne shaped bottle bubbles - hundreds of miniature bubbles can be blown every time, perfect for the celebrations! 1 x Mini Roll of Love Heart Sweets - a retro favourite! Colourful fizzy sweets with a love message on each sweet! Everybody loves getting a favour - whatever the occasion! And you won't disappoint with a Cocoon favour. Our gorgeous packaging and contents ensures that it's a favour with a difference. Ours are hand wrapped bags made from tinted wrap, gathered together and finished with curling ribbon to ensure that this is a favour that will be remembered! 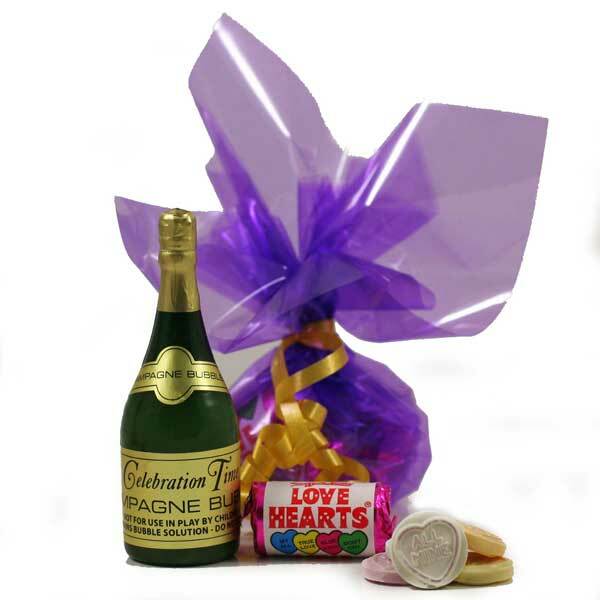 If you’d like your party bags to match your colour scheme, or you’d like us to put a cocoonparty bag or favour together especially for you, simply click on '; ?>Create your own Party Bags or call one of the team on 01604 780525 and tell us what you'd like and we’ll do our best to accommodate your requirements! 1000 currently available in stock to buy now.